Need to replace the lid that came with your Snack Trap? Want to add the convenience that comes with being able to store contained food for later? Then you need this two lid combo pack. It will give you a regular replacement lid, but will also contain the handy, Snap Over Lid. With this package, you will make your Snack Trap even more useful and versatile. Because these toddler food holders get so much use, the lid that comes with them can get worn, broken or lost over time. It is also nice to have more than one on hand so that you always have a clean one when you need it. This package will contain one direct replacement lid with the oh so familiar top design that allows small hands to enter, but prevents even smaller snacks from escaping at the same time. It will also contain one Snap Over Lid for added convenience. This one will allow you to create an air tight seal on the cup when it is not in use. This is handy for storing in the fridge or cupboard when your toddler is done, but the food is not finished. It can also be great for taking food with you on the go. Get this combo when you can't find the lid your Snack Trap came with, or order it just to make your life easier while you still have the original top. Order Yours Today! 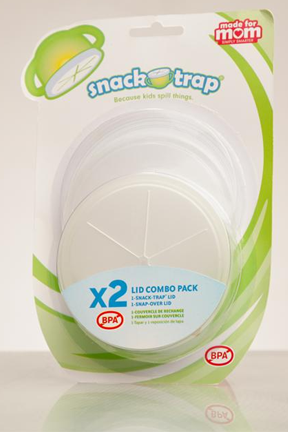 Snack Trap 2 Lid Combo Pack - Get a regular style replacement lid for the Snack Trap and a convenient Snap Over Lid. Order Yours Today! Draw Roads & Design Cities. Hours of Outdoor Fun! Replace A Lost or Worn Lid, or Add Convenience By Having Two.